And just like that, our fi rst (half) day of camp is done! Today we started off camp by giving the kids just a little taste of what is to come. 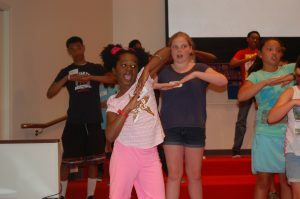 They were able to try some theatre games, dance routines, music, ASL, and even some bucket band. The kids loved playing along with Dr. Danny (as the kids call him) during Bucket Band. He had them all pretend to be bunnies in order to learn different rhythms. Who would’ve “thunk” it? They also started to learn the super cool dance moves for the song “Speak Life” by TobyMac. Check back tomorrow for more Delta (Moose) Adventures!